Djibouti (jee-boo-tee; Arabic: جيبوتي‎ Jībūtī, French: Djibouti, Somali: Jabuuti, Afar: Gabuuti), officially the Republic of Djibouti, is a country located in the Horn of Africa. It is bordered by Eritrea in the north, Ethiopia in the west and south, and Somalia in the southeast. The remainder of the border is formed by the Red Sea and the Gulf of Aden at the east. 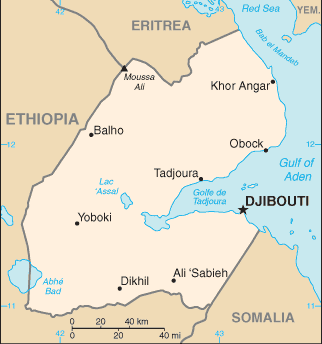 Djibouti occupies a total area of just 23,200 km2 (8,958 sq mi).